After an international career with leading food brands, including Starbucks, Taco Bell, and Pizza Hut, Jane was ready for a great pro bono opportunity. She found just the one when Bpeace posted an opening for a food service expert to assist Miniempaques, a Guatemalan producer of serving size packets of salt, sugar and other spices for the food industry. How did you get involved with Bpeace? I was introduced to Bpeace through my position as a GLG Council Member. GLG is the world’s leading platform for professional learning. Top professionals turn to GLG’s membership of more than 600,000 Council Members, experts in every industry globally, to address strategic challenges and make better business decisions. Having partnered with GLG clients for short- and long-term engagements, I was contacted about an opportunity to work with a food service company in Guatemala, pro bono. I learned that as part of their Social Impact initiative, GLG also helps Bpeace recruit “Skillanthropists,” who bring their expertise to professionals with limited resources. My background is in food service and manufacturing so I applied. I didn’t have many details on what the work would be, but I looked into Bpeace and was really excited by the opportunity to join the community. Once you learned more, what appealed to you about the opportunity? Like Bpeace, I believe that if everyone could have a job and purpose in life violence and tensions would go down. So when I learned more, I was very impressed and thrilled to see that Bpeace is approaching situations that are near-dire with very constructive business support. As an executive, I found the Bpeace founder, team and Board amazing. I read through all the staff and Board bios and said this is worthy and well-done. After I applied, things moved really fast--I was in Guatemala about two months later. But before I went, I worked with Stephany de Gonzalez, Bpeace’s Country Manager for Guatemala, and the Miniempaques team via ZOOM video meeting. Stephany kept me and the founder, Silvia Velasquez, her husband Javier Santiago, who is the CEO, and his brother Roberto on task. This helped me understand the company before diving in. Over video, we discussed what they felt they needed and wanted from me. They shared their priorities and concerns. I outlined a five-day schedule and in our last Zoom meeting we talked through the Bpeace Action Plan. I felt well-prepared for the visit, knowing that the Miniempaques team wanted me to do studies on their packaging equipment to increase productivity and to help them figure out how to earn U.S. food safety certification. I planned on a holistic approach across multiple functions which I hoped to culminate in a Roadmap with an Action Plan per the Bpeace process. I also brought along some gifts, including business books for the leadership team and books for their children. Oh, and Tate’s Cookie’s, because they had met the owner, Kathleen King, who is also a Bpeace Traveling Skillanthropist. Awesome cookies!! What was it like meeting the team? We had already established trust before I arrived so as soon as I arrived in Guatemala we started talking, we all just relaxed. They are voracious learners who were excited to learn more. I immediately felt that by working together, interviewing staff and doing a deep dive their business would do even better. How was the experience on the ground? I worked with Miniempaques Monday through Friday and we had some long days. They would pick me up at 8:00 AM and drop me off at 7:00 PM. Then I spent two hours on paperwork and planning for the next day. I also wanted to witness production, from the open to shut down. So one morning I got up at 4:00 AM to see start-up. On Saturday, my last day, they took me to Antigua for breakfast and shopping. We really had a great time together. We will remain connected for life. 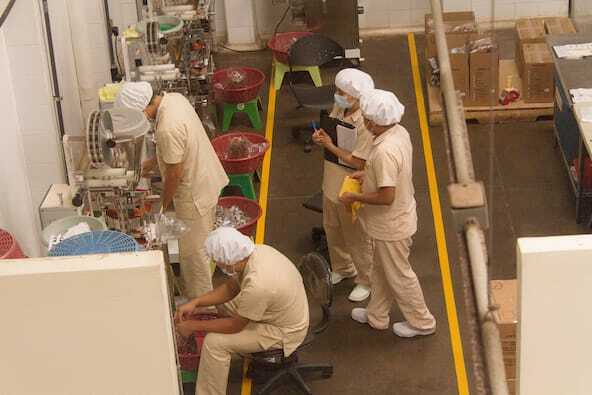 The goal was to help them create procedures and processes that would improve yield, reduce waste, maintain quality, improve consistency, and position themselves for growth. Specifically, I coached the team to run more efficiently based on their complementary skills. We worked on measure, measure, measure! We also discussed a capital plan. In the end, we had developed a strategy for regional expansion; increased productivity; sales and marketing structure and strategies; capital prioritization and planning; and more. What did you learn about the workers? Many of the employees are single parents, even the men. They like working at Miniempaques because they work a regular weekday schedule and can be home with their kids in time to have dinner. And it pays pretty well. Many of them said, "I could probably get more hours elsewhere but I want to be here and have balance to be with my family." They all love their jobs and are committed to pushing the business further. The team works very well together. Everyone sifts, everyone cleans, everyone runs various positions and everyone closes up in the evening. When they were sugar sifting at opening, it was like a dance--just so synchronized. It’s a nice, safe, and trusting environment. 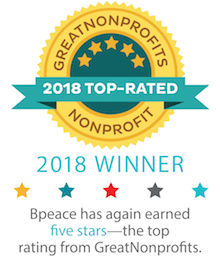 What sets Bpeace apart from other volunteer experiences you’ve had? The key element is that Bpeace selects Fast Runner companies that are primed for growth, and provides very useful tools to both the Fast Runner and the Traveling Skillanthropist. The workbooks are impressive and the Bpeace team provides structure to help make the collaboration successful. Jane Gannaway is one of 300+ Bpeace Skillanthropists who have advised entrepreneurs in challenged economies.